I’m pleased to announce that my first paper, titled “Anti-Coordination Games and Stable Colorings,” has been accepted for publication! The venue is the Symposium on Algorithmic Game Theory, which will take place in Aachen, Germany this October. A professor of mine once told me that everyone puts their first few publications on a pedestal, so I’ll do my best to keep things down to earth by focusing on the contents of the paper and not my swirling cocktail of pride. The point of this post is to explain the results of my work to a non-research-level audience; the research level folks will likely feel more comfortable reading the paper itself. So here we’ll spend significantly longer explaining the proofs and the concepts, and significantly less time on previous work. I will assume familiarity with basic graph theory (we have a gentle introduction to that here) and NP-completeness proofs (again, see our primer). We’ll give a quick reminder about the latter when we get to it. The central question in the paper is how to find stable strategy profiles for anti-coordination games played on graphs. This section will flush out exactly what all of that means. The easiest way to understand the game is in terms of fashion. Imagine there is a group of people. Every day they choose their outfits individually and interact with their friends. If any pair of friends happens to choose the same clothing, then they both suffer some embarrassment. We can alternatively say that whenever two friends anti-coordinate their outfits, they each get some kind of reward. If not being embarrassed is your kind of reward, then these really are equivalent. Not every pair of people are friends, so perhaps the most important aspect of this problem is how the particular friendship network considered affects their interactions. This kind of game is called an anti-coordination game, and the network of friends makes it a “game on a graph.” We’ll make this more rigorous shortly. We can ask questions like, if everyone is acting independently and greedily will their choices converge over time to a single choice of outfit? If so how quickly? How much better could a centralized fashion-planner who knows the entire friendship network fare in choosing outfits? Is the problem of finding a best strategy for picking outfits computationally hard? What if some pairs of people want to coordinate their outfits and others don’t? What if caring about another’s fashion is only one-sided in some cases? Already this problem is rooted in the theory of social networks, but the concept of an anti-coordination game played on a graph is quite broad, and the relevance of this model to the real world comes from the generality of a graph. For example, one may consider the trading networks of various countries; in this case not all countries are trading partners, and it is beneficial to produce different commodities than your trading partners so that you actually benefit from the interaction. Likewise, neighboring radio towers want to emit signals on differing wavelengths to minimize interference, and commuters want to pick different roadways to minimize traffic. These are all examples of this model which we’re about to formalize. Where denotes the indicator function for the event , which assumes a value of 1 when the event occurs and 0 otherwise. Here is an example of an instance of the game. We have three strategies, denoted by colors, and the payoff for the vertex labeled is three. If this game is played over many many rounds, we can ask if there is a so-called Nash equilibrium. That is, is there a choice of strategies for the players so that no single player will have an incentive to change in future rounds, assuming nobody else changes? We restrict even further to thinking about pure strategy Nash equilibria, which means there are no probabilistic choices made in choosing a strategy. Equivalently, a pure strategy equilibrium is just a choice of a strategy for each vertex which doesn’t change across rounds. In terms of the graph, we call a strategy function which is a Nash equilibrium a stable equilibrium (or, as will be made clear in the next paragraph, a stable coloring). It must satisfy the property that no vertex can increase its payoff by switching to a different strategy. So our question now becomes: how can we find a stable coloring which as good as possible for all players involved? Slightly more generally, we call a Nash equilibrium a strictly stable equilibrium (or a strictly stable coloring) if every vertex would strictly decrease its payoff by switching to another strategy. As opposed to a plain old stable coloring where one could have the same payoff by switching strategies, if any player tries to switch strategy then it will get a necessarily worse payoff. Though it’s not at all clear now, we will see that this distinction is the difference between computational tractability and infeasibility. We can see a very clear connection between this game and graph coloring. Here an edge produces a payoff of 1 for each of its two vertices if and only if it’s properly colored. And so if the strategy choice function is also a proper coloring, this will produce the largest possible payoff for all vertices in the graph. 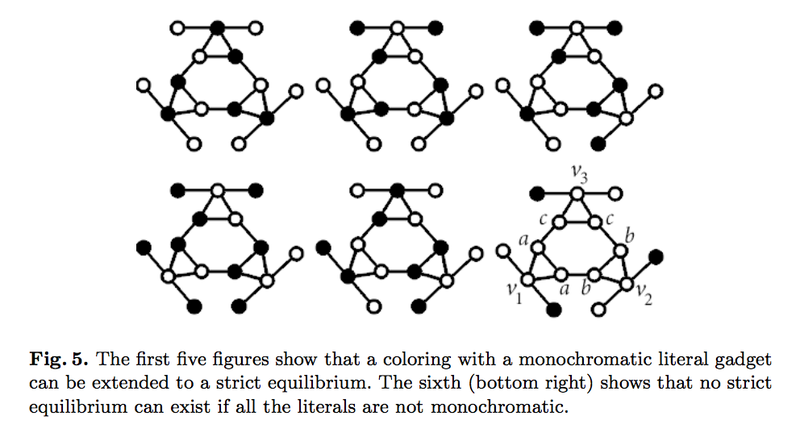 But it may not be the case that (for a fixed set of strategies) the graph is properly colorable, and we already know that finding a proper coloring with more than two colors is a computationally hard problem. So this isn’t a viable avenue for solving our fashion game. In any case, the connection confuses us enough to interchangeably call the strategy choice function a coloring of . As an interesting side note, a slight variation of this game was actually tested on humans (with money as payoff!) to see how well they could do. Each human player was only shown the strategies of their neighbors, and received $5 for every round in which they collectively arrived at a proper coloring of the graph. See this article in Science for more details. Since our game allows for the presence of improperly colored edges, we could instead propose to find an assignment of colors to vertices which maximizes the sum of the payoffs of all players. In this vein, we define the social welfare of a graph and a coloring, denoted , to be the sum of the payoffs for all vertices . This is a natural quantity one wants to analyze. Unfortunately, even in the case of two strategies, this quantity is computationally difficult (NP-hard) to maximize. It’s a version of the MAX-CUT problem, in which we try to separate the graph into two sets such that the largest number of edges crosses from to . The correspondence between the two problems is seen by having represent those vertices which get strategy 1 and represent strategy 2. So we can’t hope to find an efficient algorithm maximizing social welfare. The next natural question is: can we find stable or strictly stable colorings at all? Will they even necessarily exist? The answers to these questions form the main results of our paper. It turns out that there is a very simple greedy algorithm for finding stable colorings of a graph. We state it in the form of a proposition. By stable -coloring we mean a stable coloring of the graph with colors (strategies). Proposition: For every graph and every , admits a stable -coloring, and such a coloring can be found in polynomial time. Proof. The proof operates by using the social welfare function as a so-called potential function. That is, a change in a player’s strategy which results in a higher payoff results in a higher value of the social welfare function. It is easy to see why: if a player changes to a color that helps him, then it will result in more properly colored edges (adjacent to ) than there were before. This means that more of ‘s neighbors receive an additional 1 unit of payoff than those that lost 1 as a result of ‘s switch. We call a vertex which has the potential to improve its payoff unhappy, and one which cannot improve its payoff happy. And so our algorithm to find a stable coloring simply finds some unhappy vertex, switches its color to the most uncommon color among its neighbors, and repeats the process until all vertices are happy. Indeed, this is a local maximum of the social welfare function, and the very definition of a stable coloring. Proposition: For any graph, the price of anarchy for the strategy anti-coordination game is at most and this value is actually achieved by some instances of the game. Indeed, we can’t do any better than this in general, because the following graph gives an example where the price of anarchy exactly meets this bound. An instance of the anti-coordination game with 5 strategies which meets the upper bound on price of anarchy. This example can easily be generalized to work with arbitrary . We leave the details as an exercise to the reader. Perhaps surprisingly, the relatively minor change of adding strictness is enough to make computability intractable. We’ll give an explicit proof of this, but first let’s recall what it means to be intractable. Recall that a problem is in NP if there is an efficient (read, polynomial-time) algorithm which can verify a solution to the problem is actually a solution. For example, the problem of proper graph -coloring is in NP, because if someone gives you a purported coloring all you have to do is verify that each of the edges are properly colored. Similarly, the problem of strictly stable coloring is in NP; all one need do is verify that no choice of a different color for any vertex improves its payoff, and it is trivial to come up with an algorithm which checks this. is a solvable instance of is if and only if is solvable for . This is not a completely formal definition (see this primer on NP-completeness for a more serious treatment), but it’s good enough for this post. In order to prove a problem is NP-hard, all you need to do is come up with a polynomial-time reduction from a known NP-hard problem to your new problem . The composition of the reduction used for can be composed with the reduction for to get a new reduction proving is NP-hard. Finally, we call a problem NP-complete if it is both in NP and NP-hard. One natural question to ask is: if we don’t already know of any NP-hard problems, how can we prove anything is NP-hard? The answer is: it’s very hard, but it was done once and we don’t need to do it again (but if you really want to, see these notes). As a result, we have generated a huge list of problems that are NP-complete, and unless P = NP none of these algorithms have polynomial-time algorithms to solve them. We need two examples of NP-hard problems for this paper: graph coloring, and boolean satisfiability. Since we assume the reader is familiar with the former, we recall the latter. Given a set of variables , we can form a boolean formula over those variables of the form where each clause is a disjunction of three literals (negated or unnegated variables). For example, might be one clause. Here interpret a formula as the having the value true or false, the horizontal bars denoting negation, the wedges meaning “and” and the vees meaning “or.” We call this particular form conjunctive normal form. A formula is called satisfiable if there is a choice of true and false assignments to the variables which makes the entire logical formula true. The problem of determining whether there is any satisfying assignment of such a formula, called 3-SAT, is NP-hard. Going back to strictly stable equilibria and anti-coordination games, we will prove that the problem of determining whether a graph has a strictly stable coloring with colors is NP-hard. As a consequence, finding such an equilibrium is NP-hard. Since the problem is also in NP, it is in fact NP-complete. 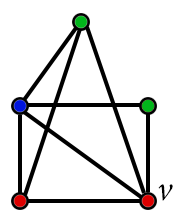 Theorem: For all , the problem of determining whether a graph has a strictly stable coloring with colors is NP-complete. Proof. The hardest case is , but is a nice warmup to understand how a reduction works, so we start there. The part works by reducing from graph coloring. That is, our reduction will take an input to the graph -coloring problem (a graph whose -colorability is in question) and we produce a graph such that is -colorable if and only if has a strictly stable coloring with colors. Since graph coloring is hard for , this will prove our problem is NP-hard. More specifically, we will construct in such a way that the strictly stable colorings also happen to be proper colorings! So finding a strictly stable coloring of will immediately give us a proper coloring of . By we mean the complete graph on vertices (all possible edges are present), and the vertices are adjacent to all vertices of the part. That is, the graph is the complete graph on vertices. Now if the original graph was -colorable, then we can use the same colors for the corresponding vertices in , and extend to a proper coloring (and hence a strictly stable equilibrium) of all of . Indeed, for any we can use one different color for each vertex of the part if we don’t use either of the colors used for , then we’ll have a proper coloring. On the other hand, if has a strictly stable equilibrium, then no edge which originally came from can be improperly colored. If some edge were improperly colored, then there would be some vertex in the corresponding which is not strictly stable. To see this, notice that in the vertices among there can be at most colors used, and so any vertex will always be able to switch to that color without hurting his payoff. That is, the coloring might be stable, but it won’t be strictly so. So strictly stable colorings are the same as proper colorings, and we already see that the subgraph is -colorable, completing the reduction. Well that was a bit of a cheap trick, but it shows the difficulty of working with strictly stable equilibria: preventing vertices from changing with no penalty is hard! What’s worse is that it’s still hard even if there are only two colors. The reduction here is a lot more complicated, so we’ll give a sketch of how it works. The reduction is from 3-SAT. So given a boolean formula we produce a graph so that has a satisfying assignment if and only if has a strictly stable coloring with two colors. The principle part of the reduction is the following gadget which represents the logic inherent in a clause. We pulled the figure directly from our paper, since the caption gives a good explanation of how it works. The gadget on the left enforces x’s to have the same truth assignment across gadgets (otherwise the center vertex won’t be in strict equilibrium). The gadget on the right enforces two literals to be opposites. The last figure deserves an explanation: if the three literals are all false, then we can pick any color we wish for , and its two remaining neighbors must both have the same color (or else is not in strict equilibrium). Call this color , and using the same reasoning call the neighbors of and and , respectively. Now by the pigeonhole principle, either or . Suppose without loss of generality that , then the edge labeled will have the part not in strict equilibrium (it will have two neighbors of its same color and only one of the other color). This shows that no strict equilibrium can exist. The reduction then works by taking a satisfying assignment for the variables, coloring the literals in appropriately, and extending to a strictly stable equilibrium of all of . Conversely, if has a strictly stable coloring, then the literals must be consistent and each clause must be fully colorable, which the above diagram shows is the same as the clauses being satisfiable. So all of is satisfiable and we’re done (excluding a few additional details we describe in the paper). That was the main result of our paper, but we go on to describe some interesting generalizations. Since this post is getting quite long, we’ll just give a quick overview of the interesting parts. The rest of the paper is dedicated to directed graphs, where we define the payoff of a directed edge to go to the player if and anti-coordinate, but gets nothing. Here the computational feasibility is even worse than it was in the undirected case, but the structure is noticeably more interesting. For the former, not only is in NP-hard to compute strictly stable colorings, it’s even NP-hard to do so in the non-strict case! One large part of the reason for this is that stable colorings might not even exist: a directed 3-cycle has no stable equilibrium. We use this fact as a tool in our reductions to prove the following theorem. 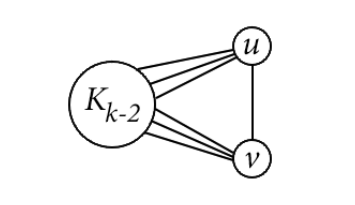 Theorem: For all , determining whether a directed graph has a stable $latex k$-coloring is NP-complete. See section 5 of our paper for a full proof. To address the interesting structure that arises in the directed case, we observe that we can use a directed graph to simulate the desire of one vertex to actually cooperate with another. To see this for two colors, instead of adding an edge we add a proxy edge and directed edges . To be in equilibrium, the proxy has no choice but to anti-coordinate with , and this will give more incentive to cooperate with by anti-cooperating with its proxy. This can be extended to colors by using an appropriately (acyclically) directed copy of . While the results in this paper are nice, and I’m particularly proud that I came up with a novel NP-hardness reduction, it is unfortunate that the only results in this paper were hardness results. Because of the ubiquity of NP-hard problems, it’s far more impressive to have an algorithm which actually does something (approximate a good solution, do well under some relaxed assumption, do well in expectation with some randomness) than to prove something is NP-hard. To get an idea of the tone set by researchers, NP-hardness results are often called “negative” results (in the sense that they give a “no” answer to the question of whether there is an efficient algorithm) and finding an algorithm that does something is called a positive result. That being said the technique of using two separate vertices to represent a single literal in a reduction proof is a nice trick, and I have since used it in another research paper, so I’m happy with my work. On the positive side, though, there is some interesting work to be done. We could look at varying types of payoff structures, where instead of a binary payoff it is a function of the colors involved (say, . Another interesting direction is to consider distributed algorithms (where each player operates independently and in parallel) and see what kinds of approximations of the optimal payoff can be achieved in that setting. Yet another direction favored by a combinatorialist is to generalize the game to hypergraphs, which makes me wonder what type of payoff structure is appropriate (payoff of 1 for a rainbow edge? a non-monochromatic edge?). There is also some more work that can be done in inspecting the relationship between cooperation and anti-cooperation in the directed version. Though I don’t have any immediate open questions about it, it’s a very interesting phenomenon. In any event, I’m currently scheduled to give three talks about the results in this paper (one at the conference venue in Germany, and two at my department’s seminars). Here’s to starting off my research career! This entry was posted in Combinatorics, Computing Theory, Game Theory, Graph Theory and tagged anti-coordination, games on graphs, graph coloring, np-completeness. Bookmark the permalink. Congratulations! As someone who just submitted his first paper, and a big fan of your blog, I am happy for you. To many more :-).